So I haven’t been writing as much as I wanted to in the past week, and this Camp NaNo thing just never got off the ground. I’ve managed a few short stories but barely cleared 10K words. I’ll have to try again in July. I’m still moving forward with the Fae of Calaveras trilogy. Witch Hunt (book 2) is done in my revisions, so it’s with my editor right now. Small Town Witch (book 1) is now on my plate for re-formatting as I get ready for a new release, now that the new cover is done. (I’ll show the cover off in another post later this week.) I’ll also release a short story in the Fae series at the beginning of May, so look forward to lots more adventures with Rosa and her magical friends. More exciting news: I’m in the planning stages of my next novel! Yes, I’m feeling ready to take on my next big project. But this one is going to be a little bit different: I’m doing it as a serial. Picture it as a television series: there will be shorter “episodes” released on a regular schedule (once a month), and then at the end the entire novel will be collected as one “season”. That means I’ll write one part, edit, and publish it before moving on to the next part. I’m giving myself some freedom to explore different small plotlines. There’ll be an overarching story by the end, though. The story will be the adventures of a research vessel and her crew on the seas of Seirenia, in my Wyld Magic series. Readers of A Flight of Marewings may remember that the mage Ameyron wanted to study the different types of monsters found in his world, hoping to create some unified system of describing the beasts warped by wyld magic. So he’s going to charter a ship full of mercenaries to help him get close to (and possibly capture) interesting specimens. Hijinks ensue! This story will be more action/adventure than deep politics or widescale epic fantasy. It’s a chance for me to explore the world and have fun. I hope you’ll come along for the ride on The Voyage of the Miscreation! 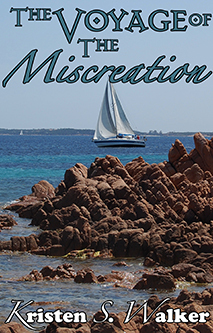 The Voyage of the Miscreation, coming soon!